The Aurora. General Advertiser (Philadelphia, PA) reports 2183 total votes for John Wagner and 2058 total votes for Anthony Stahler. October 23, 1808. The Aurora. General Advertiser (Philadelphia, PA) reports 2499 votes for Jacob Newhart and 2216 votes for Daniel Dimmick in Northampton County. October 17, 1808. The Democratic Press (Philadelphia, PA) reports 2742 votes for Jacob Weygandt, 2872 votes for John Weiss, 1821 votes for John Wagner, and 1955 votes for Anthony Stahler in Northampton County. October 18, 1808. The Intelligencer, and Weekly Advertiser (Lancaster, PA) reports 1821 votes for John Wagner and 1955 votes for Anthony Stahler in Northampton County. October 25, 1808. The Lancaster Journal (Lancaster, PA) reports 1821 votes for John Wagner and 1955 votes for Anthony Stahler in Northampton County. October 28, 1808. 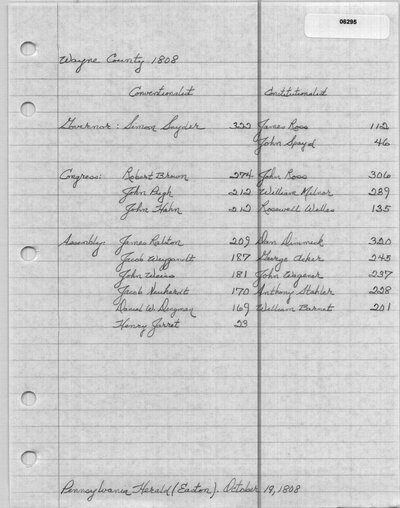 The Commonwealth (Pittsburgh, PA) reports 1821 votes for John Wagner and 1955 votes for Anthony Stahler in Northampton County. November 2, 1808. The Pennsylvania Herald reports 367 votes for Daniel W. Dingman, 233 votes for Daniel Dimmick, and 93 votes for John Wagner in Allentown District. October 12, 1808. The Pennsylvania Herald, and Easton Intelligencer (Easton, PA) reports 562 votes for James Ralston, 568 votes for John Weiss, and 536 votes for Daniel W. Dingman in Easton District. October 12, 1808. The Pennsylvania Herald, and Easton Intelligencer (Easton, PA) reports 49 votes for Anthony Stahler in Saucon District. October 12, 1808. The Pennsylvania Herald, and Easton Intelligencer (Easton, PA) reports 95 votes for George Acker in Schoener's. October 12, 1808. The Aurora. General Advertiser (Philadelphia, PA) reports 228 votes for John Wagner and 237 votes for Anthony Stahler in Wayne County. October 23, 1808. Pennsylvania Herald, and Easton Intelligencer (Easton, PA). October 12, 1808. Northampton Farmer (Easton, PA). October 15, 1808. The Democratic Press (Philadelphia, PA). October 18, 1808. Der Eastoner-Deutsche Patriot, und Landmanns Wochenblatt (Easton, PA). October 19, 1808. Pennsylvania Herald, and Easton Intelligencer (Easton, PA). October 19, 1808. Northampton Farmer (Easton, PA). October 22, 1808. Aurora. General Advertiser (Philadelphia, PA). October 23, 1808. Pennsylvania Correspondent, and Farmers' Advertiser (Doylestown, PA). October 25, 1808. The Commonwealth (Pittsburgh, PA). November 9, 1808.